With every CPU generation, we cover we have a SKU list and value analysis piece. Now that the second generation Intel Xeon Scalable CPUs, codenamed “Cascade Lake”, is released, we wanted to share this analysis with our readers. One can clearly see the impacts of increased competition with AMD EPYC at certain bands, especially in the lower cost tiers. There are some SKUs where Intel made major moves in this generation while others saw very modest clock speed increases. Number 3 on that list is new this year. We wanted to go through a comparison exercise. Many organizations will continue to buy the first generation, while new projects will likely be completed with the second generation parts. To that end, we wanted to show where in the SKU stack you may want to consider changing generations. One will notice that Intel considers the Platinum 9200 series to be a natural succession of this line, even though it is not socketed, not socket compatible, and limited in scope. With this generation, the “M” SKUs now have support up to 2TB of DDR4 memory up from 1.5TB in the first generation. There is a new “L” tier for higher memory configurations going up to 4.5TB. “F” SKUs with Intel Omni-Path have been removed. They were a great value if you wanted to use Omni-Path 100Gbps fabric, but we found they did not work in every server. We had many server vendors want to test their servers with our Intel Xeon Gold 6148F parts, but after several asked to, getting the OPA cables from the SKUs to the backplane always proved to be difficult for smaller installations. 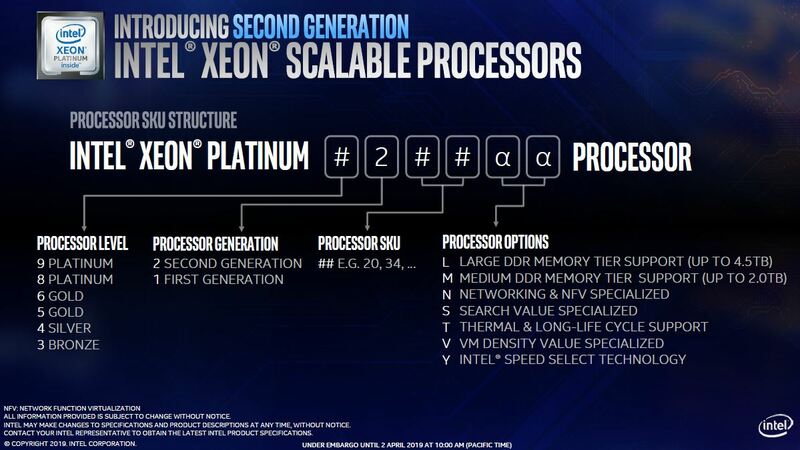 The Intel Xeon Platinum 8256 we believe is incorrectly labeled as a 24 core part. Given the cache size price and segment, this should be a 4 core part like the Platinum 8156. With that said, let us get to our analysis based on the above. Here is the full stack transcribed, likely with a few typos, from the official charts. 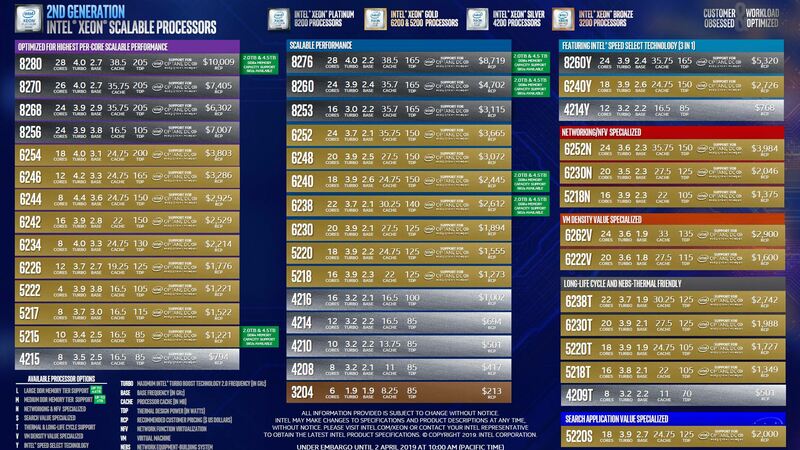 For the SKUs we had pricing on, or excluding the M, L, and Platinum 9200 series, we have the relative pricing and how many cores * clock speed you get for each dollar spent. One can see pricing is about what it was in the previous generation. One can also see a clear trend showing how its core performance optimized SKUs are priced higher. These SKUs are utilized to lower licensing costs by using fewer higher-clocked cores. As a result, Intel is extracting value here. Likewise, there is a significant premium for M and L parts. When one adds tens of thousands of dollars of memory to a system, Intel uses the M and L parts to extract a higher chip price as well. We were slightly surprised to see that, in general, these were the better value portions of the SKU stack. In hindsight, it makes sense because Intel is not targeting per-core licensing scenarios here. 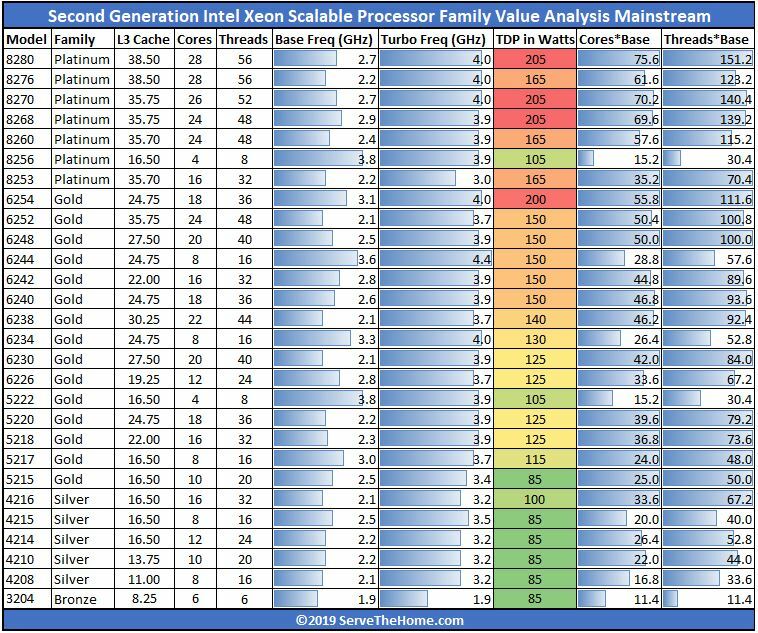 On the next page, we are going to show the differences between the first and second generation Intel Xeon Scalable processor families in generational value analysis. In your comparison table your 6252 base clock freq. is incorrect – as far as I know it is a 2.1GHz part not 2.5GHz, which seems to be the same as the Intel slides. Boost is correct though. Just waiting for ours to arrive with a new Dell R740 test box. Interested to see how it performs with LoginVSI and generally with our VDI workloads, we will also be running the same tests with the 6254 part. > Based on our testing, Intel may have added dual port FMA AVX-512 to this line. Not according to intel ARK. 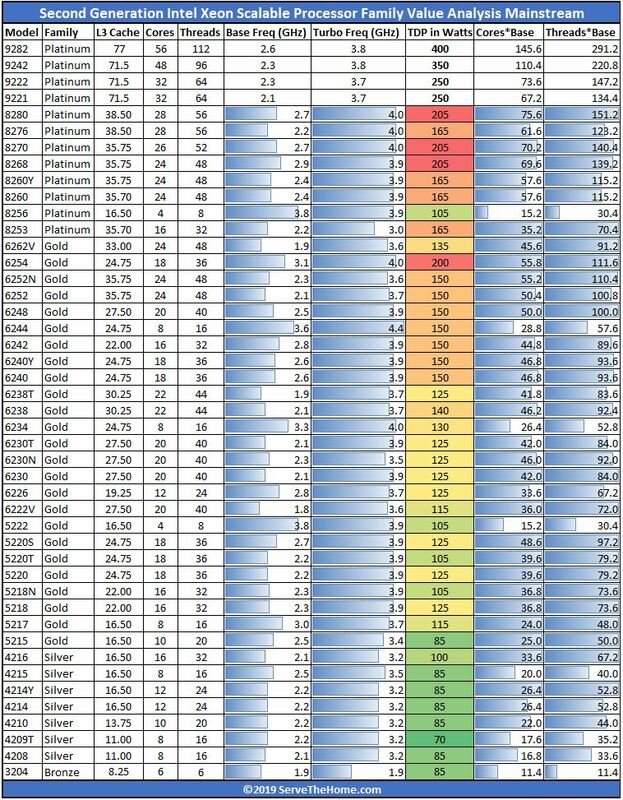 > One can also see a clear trend showing how its core performance optimized SKUs are priced higher. 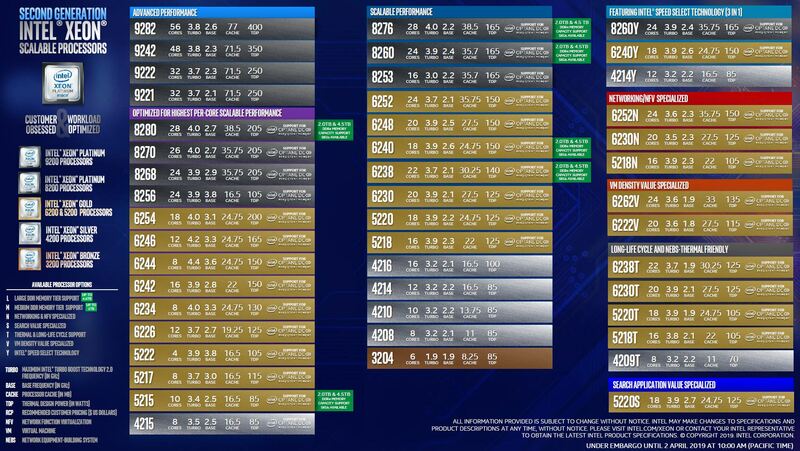 These SKUs are utilized to lower licensing costs by using fewer higher-clocked cores. It’s surprising to me that software vendors haven’t changed their licensing terms. If there’s one thing these guys are good at it’s shaking down their captive audience. Nils, we covered the AVX-512 bit in our note. It may have been the QS chip we were using. Need to re-test that one. On software licensing, we have a piece that has been sitting in our publishing queue for a month going live this weekend. Two first tables are missing cost and cost related columns? Weird, that 3204 part could very well have fit in a much lower TDP, 45W perhaps. Any particular reason why Intel would set its envelope as high as 85W? I wonder if that’s the bare-minimum for the FCLGA 3647 platform.